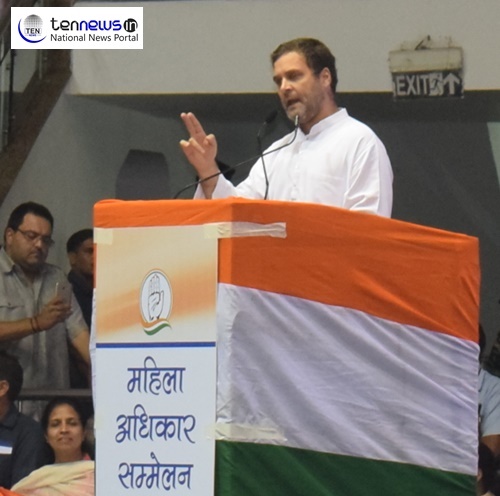 New Delhi: Scatting attack on Union Government during Congress Mahila Adhikar Sammelan, Congress president Rahul Gandhi on Tuesday said that RSS-BJP is stalling the progressive Women Reservation Bill because giving power to women is against their ideology. “Despite our emphasis and support on Women Reservation Bill, the BJP-led government is stalling it because they are against women empowerment. The parent organization of BJP, RSS don’t believe in giving power to women and it proves with their history. Since inception, they don’t have any women chief,” said Congress president Rahul Gandhi. “RSS is the organization of men, if a woman would have entered into this, she will change the entire organisation,” he added. The women wing of grand old party, All India Women Congress Committee organised ‘Mahila Adhikar Sammelan’ at Talkatora Stadium on Tuesday where women workers from across the country participated. DMK patriarch M Karunanidhi, five-time Chief Minister of Tamil Nadu, dies at 94.